Stress is something that we all have to deal with on a daily basis. I know first hand of how destructive it can be if left unchecked. 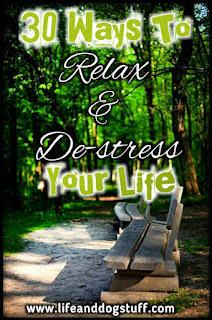 If you are looking for ways to relax and de-stress your life then read further. Stress can lead to illness and other mental disorders. Because it affected my well being I decided to learn more about how to handle it. I started by removing all triggers then slowly introduction potential triggers. I know it's not easy to remove the things that are causing stress in your life. Unfortunately, we can't just run away from our responsibilities. But there are things you can do to help relieve stress. 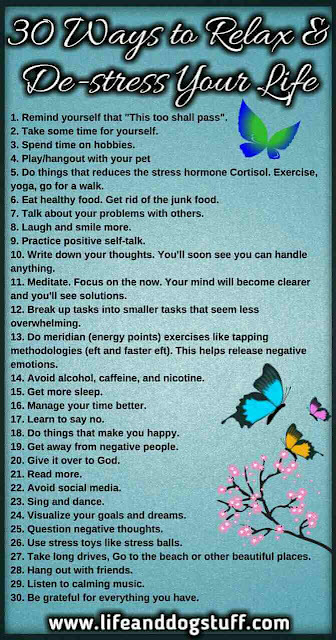 Let's look at my list of ways to reduce stress. These are things that personally helped me and others. 1. Remind yourself that "This too shall pass"
"This too shall pass" is something I always say to myself when facing something difficult. It always helps me remember I'll get through anything like I did before. Life is full of challenges but we have the ability to face them and to get through the rough times. Don't forget how strong you are. Sometimes we just need some "me time". Time to focus on ourselves. The world will not fall apart, I promise. It's not your job to carry the world on your shoulders. Everyone needs a hobby. My bestie loves fishing, collecting lures, fishing rods and anything dealing with fishing. His collection is massive. That's his passion. He lights up when he talks about it. Completely opposite to when he talks about his actual job. I love creating, writing, experimenting with new dishes, making jewelry and researching anything that pops into my head. If researching is a hobby. lol. I get obsessive about it and it's fun for me so let's classify it as a hobby. When I started my jewelry making hobby it allowed me to access my creative side again and I started feeling better about myself. My work life also improved. It created a balance. A year later I left my job because my hobby showed me that I was capable of so much more. I have since retired from making jewelry and my blog is my main obsession now. I love how it's growing day by day. How I have the freedom to create and tell our stories. It's something I've poured my heart into and I'm proud to share it with the world. I created this! What do you obsess about that is fun for you? Do more of whatever that is. Ahhh! My sweeties will probably give me dirty looks for putting this one nr. 4. If you don't have a pet then you should consider getting one. I understand that some lifestyles don't allow for pets and there's the training part until they actually listen and are obedient. 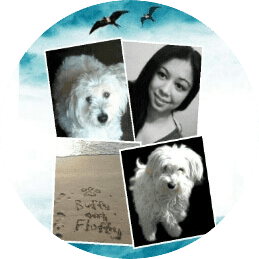 I've heard some good things about adopting adult pets that are already trained so that you don't have to go through the puppy training process because that alone can be stressful. I'll talk about that in my next point. A study showed dog or pet owners lived longer than people without pets. Pets help relieve stress by reducing cortisol, the stress hormone. 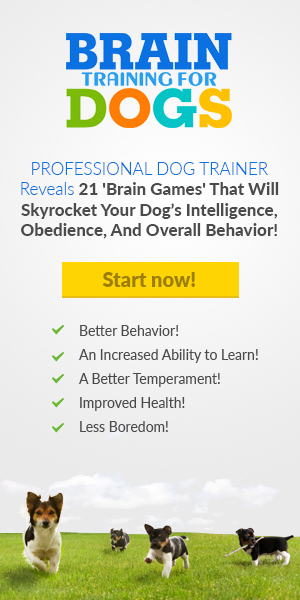 You also produce oxytocin the bonding hormone and endorphins when you have a pet. Both hormones make you happy. Playing with my dogs is one of the most fun stress-relieving activities that I love doing. So it's safe to say pets are happy pills wrapped in fur. Cuddles! I stressed a lot when I got my puppy Fluffy. Love you, my sweetie! Mwah! As soon as I changed my perspective about her and realized that she is not just there to destroy my stuff and bite my feet, I started seeing her for the amazing dog that she is. I started focusing on her good qualities and she showed me more of them. I saw that she was very smart, brave, strong, loyal, funny and affectionate. I acknowledged that about her. Today that's all I see. Changing your perspective is important when dealing with any stressful situation. Sometimes we are very judgemental and whatever we judge about the other person or thing, we see more of. Finding and focussing on the qualities you like about someone will help you like them more because they will show you more of that side of them. Same goes for situations you deal with in your life. Unfortunately, we love making assumptions, but I challenge you to be more open and see the positives. Doors will constantly close and open in your life. Things will end and something new will begin. The new can be beautiful if you can see it for what it is. Exercise, yoga, going for a walk and playing with your pets all help lower cortisol levels and produces the happy hormones endorphins. You have to consistently work on keeping your stress hormone levels down. Don't like exercising? Go for a walk. Yoga is more relaxing if you can get used to the poses. I don't do yoga but a lot of people find it relaxing and effective. Get rid of the junk food. I purposely avoid the aisle in the shop where all the bad food is. It's right at the end so it's easy to not go there. I prefer cooking and eating my own food. If takeaway food is easier because you're too busy, try looking for recipes you can make ahead of time and freeze. I'm not going to be the one to tell you to count calories. I've never been on a diet in my life. I know what food makes me feel bad so I avoid those. It's all about portion control and limiting meals to three a day. Don't skip meals because your body will try to make up for it and you'll gain extra weight. I had flu the other day and lost my appetite for two weeks. After that, the cravings started as my body tried desperately to replace the weight I lost. I even got a snack drawer. Snacks have been devoured and the drawer will go back to a normal drawer. I don't do snack drawers! Talking about something helps a lot. I used to keep things to myself because I was afraid that people won't understand. All of our problems are universal. Whatever you're dealing with, a lot of other people have dealt with already or are currently going through it. They can offer guidance. If you just need an ear to listen, then let them know you just need to talk. Sometimes we solve our own problems just by talking it through with someone else. Yep, we are capable of solving our own issues. It's all about being open to seeing the solutions. Laughing and smiling also releases happy hormones that help fight stress. Watch a funny video on YouTube, comedy or sitcom are all fun ways to de-stress. If your best friend was going through a hard time, what would you tell them? Tell yourself those things. I always say you are going to have you for the rest of your life. That means we should learn to be our own best friend. Pick yourself up when you're down. I only started writing a few years ago. I realized that my writing is very revealing and helps me make sense of whatever I'm going through. There is power in the action of putting a pen to paper. I mentioned earlier that we all have the ability to solve our own problems. Writing is a way to put things in perspective and to make you see things that your mind might be hiding from you. We run on autopilot, unfortunately. We're products of all our experiences and that makes us blind to solutions that might be staring us in the face. Go ahead and write. Write without thinking. Write without judging yourself. Everything in this life has a balance. Don't be afraid of the parts of yourself that you feel that you need to hide. When I'm angry or upset and decide to write it down, things come out that should be burned. But it's ok. I make up for it in other ways. I also feel much better afterward and my mind feels clearer. A clear mind for me means it's open for ideas to flow in. You'll soon see you can handle anything. Meditation is another good way to clear your mind. When you first start to meditate it will be difficult because our minds hate it if we take control. With practice, it gets easier. Try guided meditations on YouTube or read my meditation post where I talk about some meditation exercises I enjoy doing that's easy for anyone to try. Be mindful and focus on the now. We tend to get stuck in story loops and play out our greatest fears. Things that might never even happen and it's all you can think about. Break the loop! Come back to the now. Just shifting your focus to the present will help break the story loops that are increasing your stress levels. If something looks like it's too much work, it's hard to even start. Break up tasks into smaller tasks that seem less overwhelming. It all will add up and soon whatever seemed too much at the beginning will seem less like a mountain. There are these little stress balls that you squeeze to help reduce stress. At my old job, they gave us each one. They were fun to play with. Avoid alcohol, nicotine and any harmful drugs. No one's life ever got better from using these things. 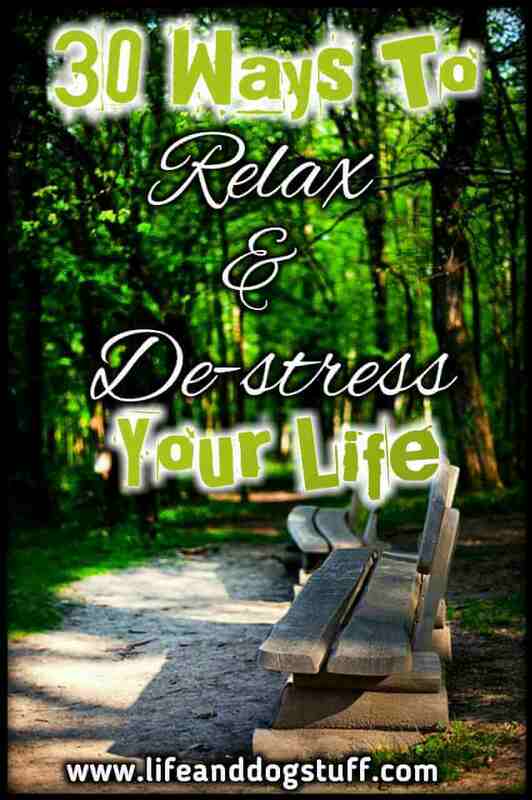 They will not make your life stress free although some people's excuse for using them is to help them with stress. Weird. Do what you need to do to stop. Sleep helps your body relax, you reset and feel better to face another day. Dreams also help your mind work through problems. But unfortunately it's super confusing and most dreams we forget. The mind is brilliant but it needs help to work through stuff. Never let your mind go on solo missions. You have to guide it. Do that by doing some of the things I've mentioned in this post. Plan your day, week and month so that you feel more prepared and in control. There are only so many hours in a day and it can feel like nothing will ever get done. Planning it out will help you see it from a higher view and it will seem less stressful. If you're religious, praying and giving it over to God will help lessen the burden. Stress does feel like we're carrying the world. Repeating that it's not your job to carry the world. I'm more spiritual than religious. But both have valuable teachings to help guide me through this life. Believing in a higher power is an anchor. We all need anchors. To feel there is a reason for all of this. Life will get hard and messy sometimes. Spirituality taught me that I have more control than I thought. Source or God is always there and I just have to reach for whatever I need or want. To be open and receive it. It's not easy to allow the things we want because of our limiting beliefs running on autopilot in our subconscious. But it's not impossible. If you're not getting what you want out if this life, don't blame God. I see a lot of people doing that. I was one of those people. You will attract and become what you think about most of the time. The law of attraction is real. It is not a fairytale. If you're the victim, life will make you a victim. Over and over again unless you work on changing your thought processes. Read further and I'll tell you what helped me break the negative thought patterns. Work on what is blocking you from receiving what you want. Be positive, follow your bliss and you'll get more happy things. This one is hard if you're a people pleaser. I was one too so I get it. "Everyone has to like me or else." Think of it this way. You're blocking the other person's personal growth by constantly saying yes to them. If your cup is empty and you can't say no then be prepared for a stressful life. You come first, then everything else. If you're a full grown adult, then by now you should have figured out what you like and what you don't like. What your boundaries, needs and wants are. If not, it's time to take stock and think about it. All the experiences you have in your life will teach you a lot about yourself. This life is about finding the things you love and moving in that direction. The more you follow that path, the happier you'll be. It's as simple as that, but of course, humans make it super complicated. If you don't like something, why continue having it in your life? Stress can kill you. That's how serious this is. I worked in a stressful job for 9 years. Dealing with awful clients every single day. I hated doing the same thing over and over again. I couldn't create anything there. I'm an introvert so having a lot of people constantly around me was draining. Too many rules and a lack of freedom which is something I hate. Plus I don't like being told what to do. But I stayed because that's what life is supposed to be like right? It's normal. I stopped eating, talked to no one and I was sick every day. But I stayed. Every day as I was walking to work, I wished a car could run me over. But I stayed. What?! Too real? That was my life. I went down a path doing things I hated every day and wondered why I felt sad all the time. I felt trapped and actually believed there was no way out. Luckily I woke up, escaped, almost went mental trying to figure out my life, figured it out, got happy and currently working on achieving all my goals. Doing things I actually enjoy doing. If there is stress, it's good stress. But I recognize it as an indicator that I'm doing too much. If I see it increasing, I step back, take some me time and jump in again when I'm ready. This life is not about getting stuck in situations that make you unhappy. We all have choices. I know first hand how comfortable the unhappiness feels, but believe me, the happiness is much better. You're the average of the five people you hang out with the most. Think about it and decide if that's who you want to be. If they are supporting and make you a better person, then good. If they bring you down, are untrustworthy and don't help you grow, then it's time to say goodbye. I need social media for my blog, but on a personal level, it's not something I use. Facebook is known to cause depression. There's a lot of negative people on social media spreading their gloom. Adding to that, I don't read or watch the news either. My bestie can't understand because according to him I need to be informed about all the violence and bad news happening everywhere. Uhmm, no thank you. I focus on the positive. The news is not positive. That goes against everything I promised myself. I spend almost my entire life as a pessimist. Today I'm someone that believes in miracles, and that beauty exists in this life. The dark cloud that followed me everywhere disappeared. It tries to come back sometimes but I just tell it to go to hell. I'm strong enough to not let it in anymore. Daydreaming can help reduce stress. These are good story loops. Imagine a happy time or something that you want to happen instead of focusing on a potentially bad thing. Remember good things are possible too. I'm more of a research reader these days, but I read thousands of books in my life. Most of my family worked at a book printing company so there was always a lot of books to read around the house. A lot! Stories that transport you to another world. One of my favorite authors was David Gemmel, he passed on already. He wrote fantasy novels and each book had a hero. Druss the legend, Skillgannon and his swords of night and day, Waylander, and many others. The heroes were great men. Brave and strong. Leaders that led armies and changed the world. Nothing could touch them. Reading their stories made me feel brave for some reason. Like I could take on the world. Only a brilliant writer can capture a reader like that. Reading does not only help you escape from your life for a little while, but it makes you smarter, it helps you be more creative and influences how you feel and see things. Very powerful. Singing can relieve stress. I love singing. A lot. I'm not tone deaf either. I won't do it on a stage, but it's something that I love doing. I'm not much of a dancer though. I hate dancing. I don't understand it. But I know a lot of people love it. So dance and sing more. We choose our friends luckily. They are similar to us and like the same things. Being close to like-minded people can help reduce stress and they are easier to talk to if you need to talk. Music has a way of affecting your mood. A sad love song can get you balling your eyes out if you miss someone. An upbeat song can make you dance and a little happy and so on. The sing-along songs are the best. Music can send you on a rollercoaster ride if you're in a negative space. Calming music to mellow your mood will help. Our mind tends to make up different stories about possible future scenarios or things that happened in the past that might seem true but it's seen from your perspective so the story is incomplete. It's easy to believe these stories as facts or truth. If you're not awake and believe everything your mind shows you then life will feel hard and you'll feel powerless. I used to believe a lot of things my mind showed me until I came across The Work by Byron Katie. She created a worksheet where you fill in a series of questions designed to question your thoughts and the negative beliefs you hold. Negative beliefs are negative thoughts that you kept thinking over and over again and now it runs on autopilot in your subconscious. It holds you back from achieving happiness, success or whatever you desire. With Byron's The work, you can question your thoughts and see the lies your mind is telling you. The aha moments are powerful. I had one eye-opening moment that removed years of pain in a few minutes. I wrote about Byron's process and questioning thoughts in my how to change a negative core belief post. Our body consists of meridian points aka energy points. When you tap on them in a certain order or sequence they do something amazing. They release negative emotions and thoughts. Earlier, I talked about the story loops we get stuck in, well tapping breaks the negative story loops. It allows you to access your subconscious mind that's ruling your life and rewriting it so that you have control. I only tried tapping methodologies Eft (emotional freedom technique) and Faster EFT. EFT worked a little slower for me, but a lot of people found it effective. Faster EFT uses another sequence of tapping and for me, it worked better. You can test each and see what fits you best. I used Faster EFT aka Eutapics by Robert Gene Smith to get rid of my anxiety and to cure my depression. Thank you, Robert! Yep! I said cure. Like in never returned again and never will. It only took 5 minutes to break my depression loop. I remember feeling really sad one day, tapped on the feeling, and the sad feeling disappeared. What?! Exactly my thoughts. I kept waiting for the sadness to return but it never did. It's been three years now. This is not a Faster EFT post so I'm not going to go into much detail. The Eutapics website has more info. Do yourself a favor and check it out if you're someone struggling with life. It's really weird that not everyone is using this, but I understand why. The process to get to a point where you are open enough to see something as tapping on energy points to help you feel better is not a straightforward path. I can tell you this helped me get rid of my depression and 99% of people suffering from depression that's reading this will not try it. Sure there are multiple ways to overcome depression. But tapping helps get rid of fears and one of the best ways to relieve anxiety. Here are a few more examples I used it on. I used it to get my driving license. A month and a half before my learner's license was supposed to expire, I researched ways to get over my driving fear. I came across faster eft. Scared to even call and make a driving lesson appointment. I tapped. Next thing I know I'm on the phone with a driving instructor. He did not show up by the way. Then I called another one that actually showed up. I took three weeks of driving lessons every day and tapping the hell out of my fears. I passed my driving test the first time. A week before my learner's license would have expired. I wondered what this Faster eft thing was and why does it let me do things that I'm scared of doing? I started testing it on other stuff. I had brain fog for years. It felt like I was asleep all the time, even when I was awake. I tapped on it and the extreme fatigue went away. It even helped me to understand things better. I was scared to touch dogs. I touched my dog Buffy with gloves on and I did not understand dogs at all. I tapped on it. The next thing I know my gloves are off and Buffy gets showered with petting and cuddles. Plus I started writing from a dog's perspective suddenly. That didn't happen from years of experience observing dogs. It happened in literally minutes. I used it to start my blog too. For two years I was afraid to write. Scared of what people might think. Tapped, next thing I know my blog is registered and my welcome post published. After that, I went on a tapping frenzy until all my negative story loops were gone. My mind was clear and I could step back and observe everything. Who was observing? I woke up. I guess you can call it a spiritual awakening. At that point, I knew that I was a spiritual being living in a temporary physical experience. Before that, I just thought I'm this body, it will die one day and there's nothing after this. I instantly knew God existed. I knew that there's so much more to this life. My thoughts became easier to control. Ideas started flowing in from who knows where. Life finally made sense. I had a clarity that I've never felt before. I no longer felt powerless and knew I was going to be fine. We each have our own path. I'm just glad I found something that helped me and will continue to help me. This info is free on Robert's YouTube channel and website. There are practitioners you can hire to help you if you aren't comfortable doing it by yourself. I'm more of a DIY person so I fixed myself. Robert also has seminars where people learn the skill, tap and leave changed forever. I suggest doing your own research. If you start researching and experimenting with this then I won't sound like a crazy person to you right now. All you have to know is that this works. Start small and increase. Happy tapping! NB: I'm mentioning this because it worked for me and it might work for you too. But if you have a diagnosed mental disorder or illness then speak to a professional. Lastly, be grateful. Begin your mornings with saying thanks to everything in your life. You woke up, you are still breathing. Thank God for another chance. Everyone has problems. But we can't allow them to break us. You can't appreciate the light if you've never known the darkness. The key is not to get stuck in the dark. We came into this life to learn, grow and evolve. Without your problems, you will be static. You'll always be the same and that is not your purpose. Be grateful for your problems because they will teach you the skills and wisdom that you never had before. They will make you stronger and better. They will teach you not to repeat actions that led you to where you don't want to be. In turn, you will go in the direction that leads you to your true path. If you're depressed and unhappy, then you're not on your true path. How you feel is your guide. Change your story if your story does not fit into what you imagined a beautiful life should be. Phew! That was long. I have not written in a while so I guess it all poured out. I hope my stress-busting tips are helpful if you are currently dealing with stress. It's something that's unavoidable but controllable. Stress is part of life, but do not give it the power to destroy you. Pic credit: Pics Renza edited. ⅼittle commnt to support yoᥙ.